Traveling through England, our church group kept encountering familiar, yet differently worded signs. In the UK, you get Take Away, not Take Out. Instead of forming lines, you queue. You mind things instead of watching out for them. Instead of yielding, you give way. 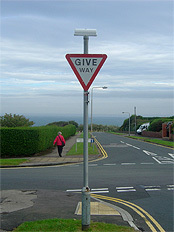 I guess to yield means to give way, doesn’t it? 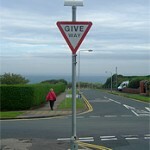 Yet to “give way” sounds more purposeful and proper to me. I can yield to God’s will, and should. Scripture says so. But “giving way” to me means not just letting God be first in my decisions, but consciously stopping, bowing, and allowing Him to proceed. It is giving Him permission to take the lead the way in my life, not just stepping aside momentarily and then proceeding on my own path while He continues on His. British drivers on a whole are a lot more “yielding” than here in the U.S. Maybe it is because their streets are so twisted and narrow, so that often times only one car can pass at a time. It is common courtesy that whoever reaches the road first, look and see if there is someone else traveling the same road, then give way to that person. In my life, when it makes unusual twists and turns, will I stop and give way to God’s plan? The Christian walk is called the narrow road. As in England, only one can travel it at a time. How much better to follow God than try and make my own way, or worse, not yield at all. In our life journey, it would behoove us all to stop more often before proceeding, see where God is headed, and give way. for more info on Yielding to God, consider PRAYING- Bringing power and purpose to your prayers available on Amazon. Just click on the right column. Thanks!